Beware of falling ice near New York City’s 1 World Trade Center. In recent days, huge chunks of ice have been plummeting from the under-construction 1,776-foot skyscraper as well as its smaller cousin, the 52-story 7 World Trade Center. “Every 15 minutes or so, a piece will come down,” Justin, a vendor who works at the plaza outside the two buildings, told 1010 WINS’ Glenn Schuck. Justin said he wears a hard hat at all times while working. On Friday, the World Trade Center’s PATH train exit had to be shut down briefly because there was so much falling ice. 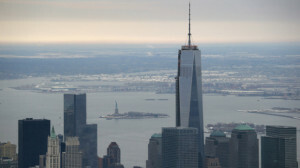 The NY/NJ Port Authority said the situation has nothing to do with the skyscraper’s design and that once the building is fully occupied and heated, the icing conditions should no longer exist. Big Mouth Billy Bass apparently got the best of a would-be burglar in Minnesota. The novelty bass had been hung near the door and would start singing whenever someone entered the shop. The Olmsted County Sheriff’s Office says the fish was found on the floor after the intruder knocked it down while breaking the door to get in late Sunday or early Monday. It was April 1956, and the No. 1 song was Elvis Presley’s “Heartbreak Hotel.” At the Woods Hole Oceanographic Institution on Cape Cod, scientist Dean Bumpus was busy releasing glass bottles in a large stretch of the Atlantic Ocean. “It was almost like finding treasure in a way,” Warren Joyce said Friday. 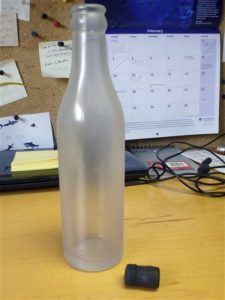 The drift bottle was among thousands dumped in the Atlantic Ocean between 1956 and 1972 as part of Bumpus’ study of surface and bottom currents. About 10 percent of the 300,000 bottles have been found over the years. “I didn’t want the reward, but they said they are sending it to me anyway,” Joyce said, chuckling. Joyce said the bottle had been sand-blasted over about 75 percent of its surface. He could still read the words, “Break This Bottle,” so he pried off the rubber stopper. Inside, there was a note from Bumpus explaining that the bottle was among many being released to study the ocean. Woods Hole archivist David Sherman said three other bottles from the same batch were found within a few months after they were dropped in the ocean: two in Nova Scotia and a third in Eastham, on Cape Cod. There’s no way to tell for sure when the bottle Joyce found washed up on Sable Island, but judging by its sand-worn condition, it may have been there for decades, Sherman said. “Some of them were probably damaged, some were probably kept as keepsakes, and the rest, who knows? We may find some more in the future,” he said.